In the wake of the state funeral for Vietnam’s legendary General Vo Nguyen Giap, we thought it appropriate to share with you some heartbreaker photos taken in August of 1945 in the mountains outside of Hanoi. They are heartbreakers only if you recognize what could have been, instead of the carnage that followed. We do not ascribe blame for the failure to build on this relationship but only want to point out that it did not happen and perhaps, could have. In the photo above, American OSS (Predecessor to the CIA) “Deer Team” members pose with (then) Viet Minh leaders Ho Chi Minh and Vo Nguyen Giap during a military training at Tan Trao, in the mountains north of Hanoi in August, 1945. 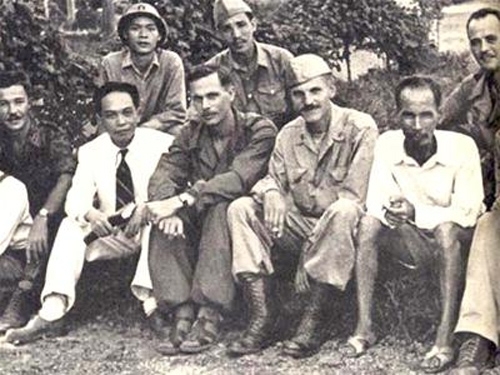 Deer Team members standing, l to r, are Rene Defourneaux, (Ho Chi Minh), Allison Thomas, (Vo Nguyen Giap), Henry Prunier and Paul Hoagland, far right. Kneeling, left, are Lawrence Vogt and Aaron Squires. (Rene Defourneaux). 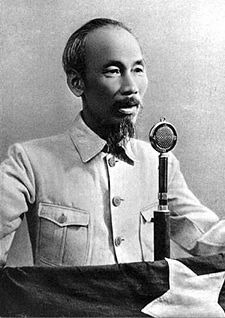 Toward the end of World War II, the U.S. Office of Special Operations (the OSS), the precursor to the CIA, started doing business with the communist-dominated Viet Minh, led by the ascetic and mysterious globe trotter Ho Chi Minh. The aim was to use the Viet Minh to drive the Japanese out of what had been French Indochina. But events were moving way too fast for coherent American policy to be made. In return for the Viet Minh’s help against the Japanese, the OSS provided the Communist-dominated group with weapons, radio sets, medicines and training. The two groups quickly became very friendly and fought as comrades-in-arms in capturing the Japanese garrison at Tan Trao. They celebrated by getting drunk together. Along the way there would be such incongruous (in retrospect) actions as an OSS medic saving the life of the very sick Ho Chi Minh. The Japanese, traumatized by Hiroshima and Nagasaki, surrendered much earlier than expected. Ho’s forces declared independence the very same day that General MacArthur accepted the formal Japanese surrender on the deck of the USS Missouri, September 2, 1945. In so doing, Ho’s Viet Minh looked to America for friendship and even included some phrasing from the American Declaration of Independence in their own, with Ho carefully checking the words of Thomas Jefferson with his OSS colleagues by radiophone from a shophouse in Hanoi’s Old Quarter as it was being drafted. Ho was clearly influenced by the political writings and values of the American Founders. Up on the stage at Ba Dinh Square in Hanoi, clear for all to see, OSS Major Archimedes Patti stood behind Ho. There are photos of Patti saluting the Vietnamese flag as the band played the Vietnamese and the US national anthems. Then, coincidentally, a clearly-marked U.S. plane flew over Ba Dinh Square during the ceremony. Was it by accident or design? It remains a mystery. Either way, it was apparent to everyone in the square that day that Ho Chi Minh (and Vo Nguyen Giap) had powerful backers and that the forces of Ho Chi Minh were clearly the political and spiritual leader of the Vietnamese revolution against the country’s French overlords. Meanwhile, Chiang Kai-Shek’s undisciplined and rapacious troops, defeated Japanese forces, some French military people and colons and a few bemused Americans all milled around in Hanoi waiting for resolution of the dangerous and confused situation in which Indochina found itself at the end of World War II. The U.S. adventure in Hanoi ended quickly, and it swiftly became clear that the French would fight to regain their lucrative colonies in Indochina. After all, because the mother country was, at the time, reduced to rubble–it was critical for France that she quickly re-open her colonial cash pipeline from Vietnam in the rubber, tin and other profitable Vietnamese exports of that era. At the same time, bewildered U.S. policy makers in the inexperienced Truman administration were dealing with domestic pressures to send U.S. forces home and anxiety about upsetting the French. 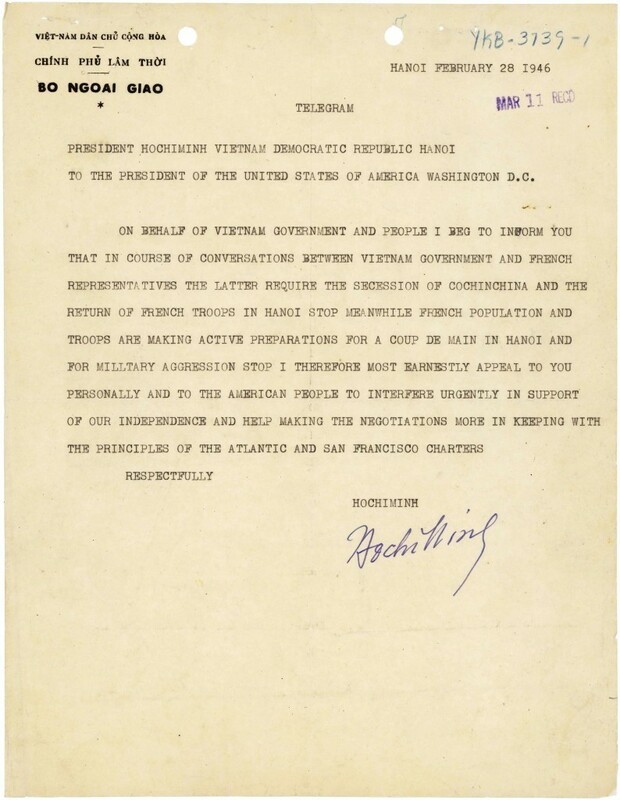 While the precise point at which the Truman Administration turned its back on Vietnam is unclear, we do know that France was desperate to re-start its colonial cash flow and de Gaulle, always playing hard to get, was dragging his feet during the negotiations on French participation in the precursor to NATO, the Western Union, initiated formally in 1948. [by, say, letting the Vietnamese have democratic control over their own country]. Truman and the U.S. State Department made no response to Ho Chi Minh’s numerous telegrams seeking assistance against the French. Washington feared that in the chaos and economic distress of immediate post-war France that the communists would take power there. So it pulled back from what had seemed to have been its support for Vietnamese nationalism under the Viet Minh and began to support the French. The die was cast for a future conflict and, as Minister of Defense during the Vietnam War, Vo Nguyen Giap, would play a crucial role against his old comrades from the United States.